Here they talk about that no-longer-new trend first pioneered at now-closed El Bulli in Spain, how they define their own cooking styles and what fine food is all about — and what it isn’t — along with popular cooking approaches like sous vide. These lengthy, technique-focused interviews took place last year. Kinch has been a force in the Bay Area’s cooking scene for many years, starting in the ’90s with his first restaurant, Sent Sovi in Saratoga, and now at Manresa, his Michelin two-star in Los Gatos. 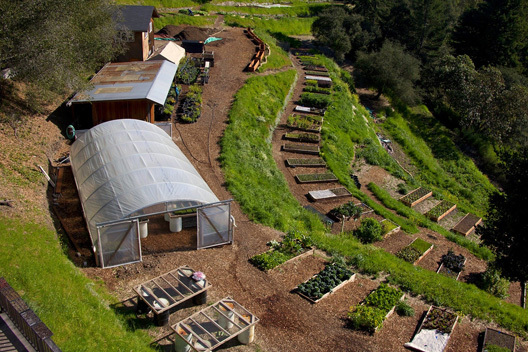 This lovely temple to transcendent cooking keeps getting better and better, assisted by a biodynamic garden in the Santa Cruz Mountains where Kinch began getting most of his produce starting a few years ago. Question: What’s the status of food trends like molecular gastronomy? David Kinch: (Molecular gastronomy) kind of defines a certain use of products and chemicals and techniques. In my mind, the reason it’s fading in general is that they were used to create as an extreme value the act of creativity above all else, including taste — which is a real key for this conversation. But also, to be sensational. To create a certain element of surprise or the sensational. You can only go so far with those elements. The first basic act of a cook is to nurture and cook for people and make them happy. When certain things — and I think molecular gastronomy is guilty of this — becomes more about the cook and the process than it is about the very foundation — people coming into your restaurant, paying you money, they enjoy their experience and they come back and you stay in business. Creativity and quality are a fine line. But that said, these chemicals; I’ve fooled a lot with them to see what their effects were. I don’t use much of anything anymore. We did flavor pearls at the end of Sent Sovi in ’99. A little bit at the beginning of Manresa, but we’ve really moved away from it. If it can help us to achieve what we want to achieve – which is to be a sense of place; to be who we are and where we are: central coast of California — (we’d consider it). Question: How do you define Manresa’s cooking? 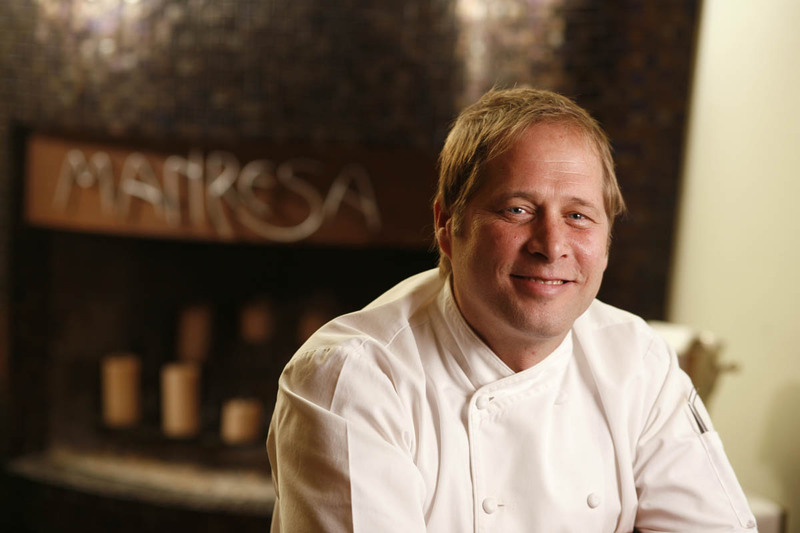 David Kinch: We’re trying to be a contemporary California restaurant. I think a lot of the use of those products defines an international style and it doesn’t matter where it is. It could be London, Tokyo, Chicago. You could pick these restaurants up and put them down anywhere because of the products they use and how they use them and effects they’re trying to achieve. It has an almost kind of homogenous feel and look, which is really ironic. They’re all trying to be creative and different but they’re operating in such a narrow constraint of what creativity is that they all end up being the exact same thing. These atmospherics — creating a sense of place — is part of the lexicon of modern gastronomy right now. (Like) evoking a forest floor or a seabed. It’s not a dish per se, as in protein, vegetable, sauce, but elements on a plate that kind of evoke a place, but everything is in balance. A nice flavor profile; there are similarities but there are contrasts. All the other things that are part of a great dish. 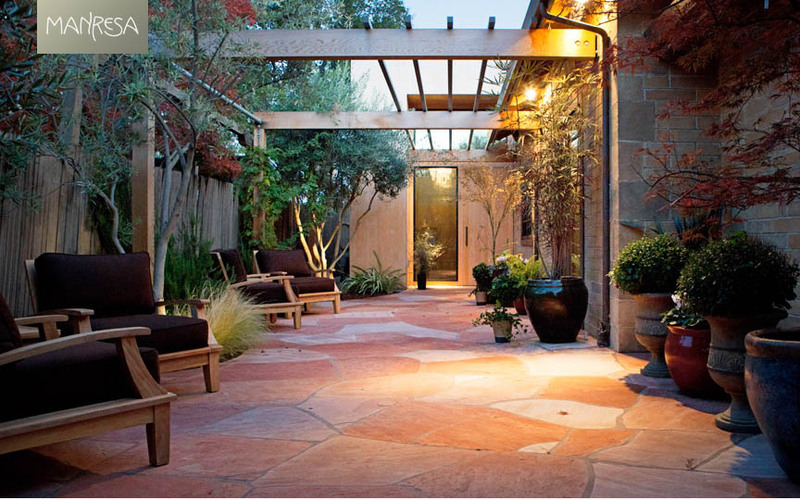 Manresa recently was expanded and remodeled, including a gorgeous patio. Question: What about sous vide (plastic-sealed foods cooked long and slow in a water bath)? Many molecular gastronomers and other chefs use it a lot now. Do you? David Kinch: I used sous vide like crazy but I’m backing off from a lot of sous vide. I do it with fruits. I do it with vegetables to a certain extent. But as far as meat and fish, I have backed off a lot from it. I’m gonna take a lot of flack for this, but I think sous vide creates a homogenous texture, regardless of the product. Beef, lamb, pork. You put it in a bag and you cook it and you know what you get? You get something quote/unquote perfectly cooked. The collagen is broken down, a little bit of fat is rendered. All the juices are still in the bag! What can I say? But it all turns into (something with) the same texture: softness. (Kinch mentions how French Laundry chef Thomas Keller — who published a book on sous vide — was inspired by the rich foods and techniques of French stars of the ’90s like Joel Robuchon and Michel Bras.) Those are guys he wanted to emulate. (Sous vide) gave (food) that richness and that softness; the taste of richness and the taste of luxury. What sous vide does is it renders everything to this soft, luxurious texture, but to me, it gives beef, lamb and pork — and to some degree, chicken — that same homogenous, soft texture. You lose the intricate, the intrinsic qualities of the specific product. And if you’re going to spend a hell of a lot of money for a lamb of provenance, I think you have to cook it to some sort of way to where the intrinsic parts of the lamb that make it so special shine through. Over the years, I have determined for my own taste that sous vide robs products of that. Might the lamb be a little bit more chewy? Maybe so, but that’s the nature of the product. That’s what it must be. You can cook it correctly by traditional methods. That’s one of the reasons we have experimented with slow roasting. We’re at a point now that we can roast things and juice does not leave the meat. That is doing it correctly. There’s also a reductive nature in the flesh of meat. Water evaporates and flavor concentrates. There’s also impurities in meat. A lot of this disappears through natural cooking methods. Seal it in a bag and that whole trumped-up “none of the juice comes out.” Well, none of the water comes out, either, and none of the impurities come out, either. Consider the reductive nature of a piece of meat, raw. There’s a water content to it and through long, slow, careful cooking in which the juice of the meat doesn’t run, but there’s a natural evaporation of the water. To me, that reductive quality aids in the quality of the meat. We take a small rack of lamb and we spend an hour cooking it. We put in a soft oven for five minutes, we pull it out and we let it rest for ten. It goes back in the oven for three minutes, let it rest…. You know, no juice comes out. Just like in a sous vide bag. It keeps all the juice in there. There’s this reductive nature to it. You read the tome on sous vide. I’m not going to mention any names. You read Thomas’s book, he talks about this “softness” and this “flavor.” The thing that keeps popping up time and time again, he talks about the consistency of the product. That’s great for a restaurant. That’s fantastic for a restaurant. Thomas has a lot of different restaurants and people go and they expect a certain level of consistency in the products. And sous vide gives you that. Prisons and hospitals have been doing (sous vide) since the ’70s! That’s where the technology came from. It’s been around for 40 years. Is it good for some things? Yes. To me, it’s one of the best ways to cook chicken. It still tastes like chicken. But for lamb, beef and pork, I don’t touch it anymore. Love Apple Farm in the Santa Cruz Mountains produces the majority of Kinch’s sublime produce. Question: Do you use sous vide with other ingredients? David Kinch: (We use it for vegetables.) We do a lot of vegetable compressions. You seal pieces of cucumber in the bag and what it does, it breaks down the cell walls of the cucumber. It gives almost like a cooked texture but it’s still raw; it tastes like a raw cucumber. It becomes super crunchy. We might serve it in a salad. And we make cucumber noodles. We cut cucumber raw cucumbers into the shape of fettucine noodles and we compress them. It’s like they’re cooked; they become limp but they’re actually still raw. We dress it like a salad and serve it. It’s part of an abalone salad we’re doing now. (Sous vide) is great for marinading. I don’t sous vide rack of lamb but I do take rack of lamb, put herbs and oil in the bag with the rack of lamb for 24 hours and it speeds up the process of marination. That’s one thing the bag is really good for. Question: If molecular gastronomy’s day has passed, what’s now in its place? 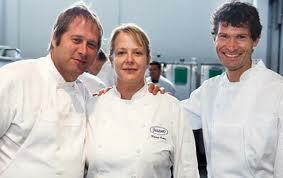 David Kinch: I think this movement away from molecular gastronomy, you can almost describe it as a new naturalism. It would be more correct to call the edible dirt or the soils that are being done under that (category). Things are coming around to our way of thinking. It’s amazing. All during the molecular gastronomy thing, we took a lot of heat for not jumping on the bandwagon but we stuck by our goals and we were regarded as old fashioned or passé but you know what? Everything’s coming our way right now. Everything’s shifting. 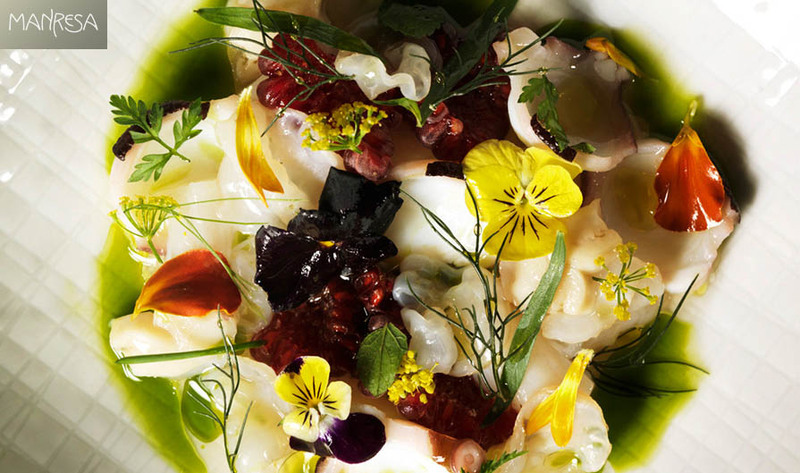 Rene Redzepi is the godfather of this whole new naturalism movement. Michel Bras is, of course, like the godfather to all this. But the fact of the matter is, Manresa’s been doing this for six, eight years and it’s something we don’t get credit for. Rene will tell you that. I had dinner with Rene on Monday when he was on his book tour. You know, we argue a lot. That’s what we do when we’re together. Rene is creating a sense of place for the Nordic countries. And that is what I am trying to do at Manresa. I am trying to create the quintessential contemporary California food experience. We’re not based on sensationalism, we’re not based on surprise. We’re not based on trends. What we’re trying to do: When people come in and eat at Manresa, they know exactly where they are in terms of a personal vision. Of who we are and where we are. You’re on the central coast of California in the foothills of the Santa Cruz Mountains really close to the Pacific Ocean and all that entails. That’s what we’re trying to paint a picture of, not only with our food but with our service and our ambiance. To use a lousy word for it, it’s terroir. Restaurant terroir. Young cooks are starting to realize this. Instead of being sensational and being “Look at me, look at me with my chemistry set. Look at what a technological wizard I am. Look at what kind of creative genius I am.” Instead, they’re starting to realize the true value of food; the sense of place and nurturing people. And the trick is not to do this in an old-fashioned, fuddy-duddy way but to do it in a real contemporary, modernist sense. And if a lot of the tools of molecular gastronomy — some of the good aspects of molecular gastronomy — play a part in that, then that’s fantastic. Question: Are there any molecular gastronomy tools you do use? David Kinch: (Mentions that he won’t use Pacojets because he hates the resulting texture.) (Pacojets) can make a perfect quenelle and (chefs) can put it on the plate and it looks great and all the bloggers take photographs of it and it’s really beautiful. But people are eating this stuff! I put it in my mouth and it’s like gum. You can taste it in the background. Do we use agar? Yes. But we’ve been using agar for 10 years. We use a little xanthan gum. We use a little bit of gellan gums for fluid gels. But we don’t use it to thicken a sauce, we use natural methods. We use the xanthan to stabilize it. You know, when you make a homemade tomato sauce and you put a dollop on the plate and it kind of leak water? You add a pinch of xanthan gum, it doesn’t change the flavor, it doesn’t change the texture, it doesn’t thicken in any way, but when you add a certain amount, it will prevent that water from running out. To me, that’s one of the great things about molecular gastronomy, you find the use of xanthan gum to be a useful value like that. (But) if you thicken a sauce with xanthan gum, you’re gonna get something with the texture of snot. Question: Any more thoughts on food trends? David Kinch: All the (restaurants) like Alinea and Fat Duck, who trumpeted molecular gastronomy as a trend, now they’re really backing away from it. I find that amusing. (Mentions that molecular gastronomy was invented by Spaniard Ferran Adria). Then everyone was copying Adria. Now they’re copying Rene. It’s all cyclic. It comes, it goes. The thing is to find your own voice and follow it. That’s what I tell my cooks. Imitate, assimilate, then innovate is what you gotta do. It’s fine to read about what they’re doing and fool around with it but when you copy people, it looks like you’re copying people. And people know it, particularly in the days of the Internet. The key is defining your own voice. All those machines (for molecular gastronomy) are going to be on eBay in 16 months, you watch. Cuisine is dynamic. It’s always moving forward. There’s always something. In the 70s, the Cuisinart came along. People freaked out. This was new technology! And there were a lot of people who didn’t want to use them because they said it was brutal to the food. Things come along and you incorporate it into what you’re doing and then you move on. It just becomes part of the lexicon or what people use. Technology has always been a big part of food. Kinch does vegetable wizardry at Manresa. Question: So what drives your creative process at Manresa? David Kinch: We’re concentrating on our farm. (Mentions how it reflects the now-popular “super-locavore” movement.) What I’m calling it is the new naturalism. That’s how I see it heading. People understanding their local ingredients, not using them to make a political statement but as a qualitative statement. To be exhibiting a sense of place, not because it’s political and correct to be using something from within 100 miles. Why I buy (some) fish from Japan, because it’s great fish. The reason why I grow my vegetables is not to make a political statement but because these are the best vegetables I can buy. It creates a degree of separation between me and the farmers market. I go to the Ferry Building and it’s great product up there, but there are three chefs in front of me and three chefs in back of me in line and we’re all buying the same thing. So how do you create that degree of separation that makes you better? Or makes you a more unique voice? I don’t mind being a contrarian. The reason why I feel the way I do about sous vide is because I sous vided everything for a long time and I had questions about it and I tasted the sameness. And I don’t want to sous vide because everyone else is sous viding. I want to sous vide if it’s actually gonna help me be a better restaurant. 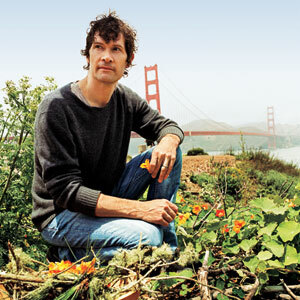 Gifted chef, restauranteur (with a growing portfolio of well-regarded Bay Area restaurants, including Coi and Plum and reportedly more on the way), cookbook author, food writer — Patterson is multi-talented and must not need much sleep to keep juggling all his many activities. He brings an intelligent thoughtfulness to his food and his conversations. Question: What’s been happening in the world of food trends? Daniel Patterson: The last 10-15 years have been a time of incredible innovation. It’s really changed the tools at the disposal of chefs but with that being said, I think some of the things will have staying power and some won’t. It’s hard to draw a broad generalization about something like cooking, which is so personal. For example, at Alinea (famous molecular gastronomy restaurant in Chicago), they do all of these things. Does that mean that it’s not a valid cuisine? 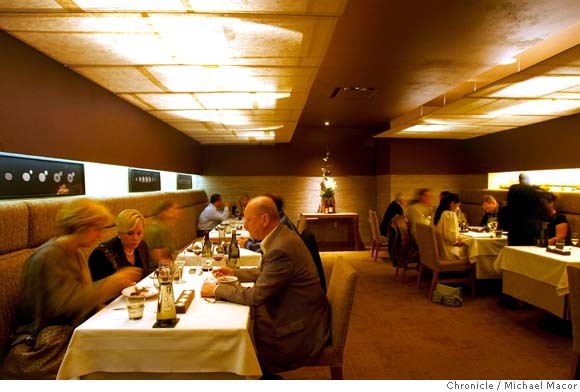 Or if Alinea — being one of the great restaurants – doing all those things, are they missing out? I don’t think you can say either of those things. 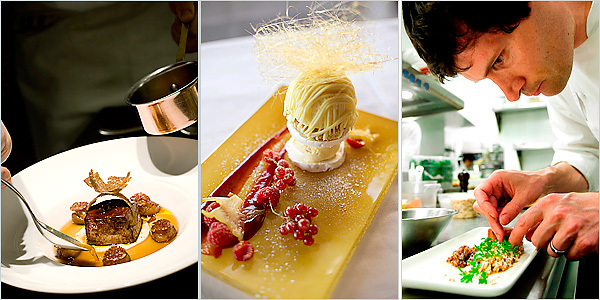 Question: Has molecular gastronomy’s time come and gone? Daniel Patterson: I have no idea. I can say for myself that there are not many of the techniques and processes that we use in my kitchen. Or have applicability to the way we cook. Our interest is cuisine that’s an expression of place and personality. We focus a lot more on the ingredients and on the techniques that get us to where we want to be. We have Pacojets and circulators (the latter is used for sous vide). (Mentions that he’s interested in going in on a rotary evaporator with his perfume consultant.) They’re very expensive. Some of the magical dishes served at Coi. Question: So what inspires your food? Daniel Patterson: Right now, we have a first dish on the menu at Coi that is evocative of harvest. There’s this very thin, delicate walnut tuile. There’s roasted almonds that have just been harvested. There’s three different kinds of vegetable leathers. You know fruit roll-ups? We made them with different combinations of vegetables and fruits. So fennel and pear and burnt onion and fig. And then there’s a piece of apple on the plate. You eat it with your hands and (it evokes) this childhood memory. We have a (convection/steam) oven and we set it at 70 degrees with zero percent humidity. One of the leathers we do very thin and crisp. It comes out of the warm oven and it’s cooling down and it’s crisp right at the moment at which it goes to the table, but if we left it out, it wouldn’t be. Question: Do you use some of the techniques and tools of modern kitchens? Daniel Patterson: We’re using technology but not in a way where you’re necessarily going to see it. (Mentions that he doesn’t have an anti-griddle, which creates softer-center food with frozen exteriors) but I’d love to try one. Also, it’s hard when you’re talking about ways of handling food that were created by other people that you don’t have a lot of familiarity with. It’s very easy to fall into the kind of cooking that’s basically mimicry. I had an employee who was really into the hydrocolloids (a substance that forms a gel in contact with water), so I tried a lot of things but in the end, it just wasn’t me. It distanced me emotionally from what the food was. I was at a chef’s conference in Europe last week and someone asked me, how do I feel about hydrocolloids and all that stuff. And I’m of two minds. One is that I went through a period where I took everything off (the menu) because I had to think about how I felt about using products that were created for industrial food. (We use all pastured meats and eggs); I’m really, really sensitive to ingredients. Now, we really don’t use much of anything. We don’t use xanthan gum. For me, one of the things I discovered is that a lot of what is considered “modern cooking” leads to laziness in the cooks. So if they’re making a sauce, and they discover they don’t have to reduce it all the way. If they can use a little bit of guar gum to it to get this shiny, beautifully textured sauce, they don’t spend the time they need to spend thinking about the relationship between the meat and the bones and the vegetables. How much water goes in to make the stock in the first place. How much stock goes into the secondary sauce. How much it’s reduced. Where you have that perfect synthesis. That’s really where the cooking comes in. There’s a very distinctive, experiential quality that I think you can taste. Basically, a lot of hydrocolloids become short cuts. They bind things. They cover up mistakes. But for me, agar — which is a seaweed derivative; it’s been used in Japanese cooking for hundreds of years — we use that. But we don’t go too, too deep with the other stuff. And it’s not because I have anything against it. It’s not who I am. I’ve done some events with Albert Adria (brother of Ferran), who basically created many of the techniques that are used today. The guy’s a genius. He’s unbelievable. For him, when he uses a lot of these techniques and chemicals and all that stuff, the food that comes out is magic. It’s incredible. It’s just who he is. So I think there’s a danger in making big proclamations because cooking is so personal. What I can say for me is that I’m more interested in how I can express a certain viewpoint and express the ingredients we’re using in a vivid way. (Explains that his kitchen uses a Pacojet for ice creams and sorbets.) It’s really good for certain kinds of infused oils. You freeze the herbs in the oil and basically spin them and as it warms up, the oil drips through because it’s cut so many times but it’s also kept cold — it never warms, so it’s a very pure expression. Coi in North Beach is a quiet culinary oasis. Question: Where do your cooking ideas come from? Daniel Patterson: (Mentions the growth in “chef’s congresses” — events attended by top chefs across the globe — which he has attended.) Some of my friends go and take notes. I’ve always felt kind of guilty because I never do that. I never even watch (the demos). That’s just not how I learn. I learn by tasting things. I’m more interested in the gut-level, instinctual, emotional quality of food. I don’t go there thinking, “they use that technique; I want to use that technique, too.” I like seeing other people’s point of view; I like seeing how they see the world. But for me, I never go there thing I’m going to pick up things to take back and do in my kitchen. I want to go back inspired in a general sort of way and I always do. I’m inspired not just by what people are doing with food but my spending time with them. Trading ideas about our restaurant philosophies and that sort of thing. (States that molecular gastronomy will continue to have an impact on chefs and cooking but it’s just one step in a long progression). If you think about the arc of modern cooking, (you must consider early figures like) Carême and Escoffier and (later), Fernand Point. This is one of my big beefs with the young cooks — they don’t know their history. They don’t know the history of the place where they’re cooking. They don’t bother to research how people have used ingredients in their area for hundreds of years. They don’t bother to know how spices have been used historically. In terms of cooking, you don’t always know the progression. When you say that Ferran (Adria) is basically the modern-day Fernand Point, you get a lot of blank stares (from the young cooks). That’s what I would say. And then you go into the second generation, where you have Bocuse and Alain Chapel and Fredy Girardet. And then you get into nouvelle cuisine. You have this progression; a movement toward lightness, brighter flavors. Fernand Point himself had a focus on getting away from the traditional canon. (He did) dishes that were rooted in the products around him. All of these things (are) an aggregation — a movement toward what we think of as “modern.” And then you have a few seminal chefs like Michel Bras. 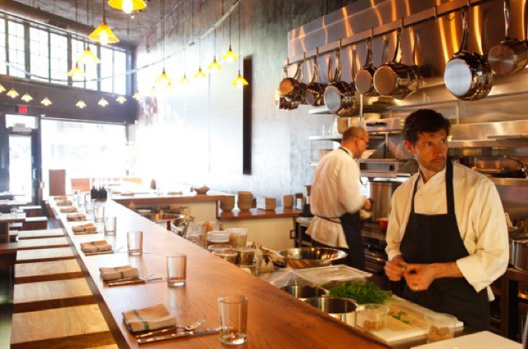 Plum in Oakland is a casual but outstanding newer restaurant in Patterson’s growing empire. Question: So where do such great chefs get their ideas from? 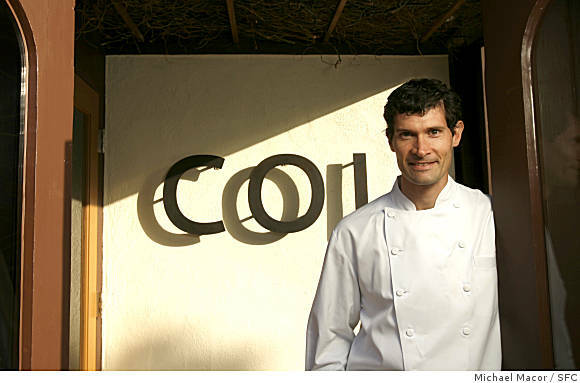 Daniel Patterson: When Ferran Adria started, he went to different places to learn. He didn’t start out as a revolutionary. He started out brilliant because brilliant people are brilliant but his cuisine was so personal to himself but there were a few other players along the way. But taking him as the primary. And Albert (Adria), who isn’t given as much credit as he deserves. The whole paradigm of what cooking is — they changed it. He reached a point when he wasn’t even thinking so much about –“is everyone going to like it?” The thing for him is: Are they going to be challenged, moved? Are they going to think about things in new ways? There was an entire philosophical shift from — we’re gonna create food for a group of people who largely know the same things we do. And that food, they’re going to recognize but we’re gonna put a twist on it. You have a very clear line between the place, the product, the customer, the chef. And Ferran — he broke all that open. He created cuisine without reference points. Asian flavors. Not that other people weren’t doing that to some degree. Him and a few other people — but (most definitely) him, being the most famous (molecular gastronomer). Making food that was like made by a Martian. Things that don’t look like anything you’ve ever eaten. There’s no taste reference point, even though there’s a strong cultural precedent for what he’s doing. It’s in art. It’s in Catalan culture. He still uses so many products from his area, but his imagination is what changed everything. So now, there’s a way of looking at food that has totally changed, right? You used to make food to feed people but now, there’s this idea that you make food that isn’t about that. Yeah, sure, you’re feeding people but you’re feeding them on all of these levels, of which, the sensory level — the taste — may sometimes not be the most important. So you push that to where we are now. When you say, will things remain, and what happened and what’s important about it. Question: Hasn’t the “audience” changed as well in order for such ideas to be successful today? Daniel Patterson: The world has changed so much in terms of how customers understand food. People who come into our restaurant now versus 10 years ago. It’s radically different what their expectations are and what excites them. What’s changed is people get excited about conceptual elements and ideas. As well as (about) the way things taste. Question: Where is all this creativity headed? Daniel Patterson: I think out of all the techniques (Adria) created, many will become part of the normal canon of chef’s tools. I don’t know what percentage that will be, but there are certain things that will just become known and useful. Think of how you make a buerre blanc. Well, no one invented buerre blanc. Well, it was invented, but I mean, no one who’s cooking today invented it. And some day, that will be the case (with molecular gastronomy). Things normalize. But I don’t even think the techniques themselves are the point. What changed is the attitude toward cooking and creativity and the role of the chef within the process. It opened up as many questions as it answered. I don’t think half those questions are gonna be answered anytime soon. I think it’s kind of nicer that they remain as questions. So everyone can answer them in their own way. For me, there’s an approachability to what I do and if it’s not there or if I try to be too esoteric, (my food) would lose its spirit. So much of what (Adria) does is by its nature unavailable to me. Unless I wanted to do something that people wouldn’t like. Question: Playing with aromas and essential oils is one of your techniques — and this has also been a popular molecular gastronomy element. What have you been doing lately in this realm? Daniel Patterson: Aromas – we do it all kinds of ways. Aromas through how things are seared. Aromas through smoke. We do use essential oils, but very sparingly. Not so they jump out at you. Right now, we are using pine needle essence in a potato puree — it’s a potato foam, basically. When you get the food, it seems very natural. Sometimes, there’s a lot of work that goes into making it seem natural. I think that’s something that gets lost in the shuffle sometimes. If you’re talking about a stylistic bent toward naturalism, I think that’s definitely afoot. But, naturalism doesn’t mean less work, in a way, it means more work. But great ingredients, locally sourced, that never goes away. This entry was posted in Food Articles and tagged Coi, cooking trends, david kinch, Kinch, Manresa, molecular gastronomy, Patterson, remarkable cuisine. Bookmark the permalink.